The Thimm Multipack | box literally took on a carrying role at the Promotional Gift Award 2017. The carrier banderole for promotional products and product ranges that won a prize in the category Packaging convinced the jury members among others with its material-saving construction that at the same time allows a high product visibility. Furthermore, the innovative solution serves as an ergonomic means of transporting items and allows the consumer-friendly extraction of the contents. The mono-material solution comprises to 100% of corrugated cardboard and can be full-surface imprinted in line with the customer’s specific requirements. As a result of the reduction of the cut size, up to 67% material can be saved compared to standard solutions and the subsequent uncomplicated disposal in the waste paper rubbish is environmentally-friendly too. 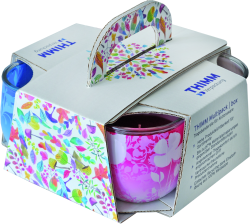 The Thimm Multipack | box is ideal for POS promotions in the FMCG sector (Fast Moving Consumer Goods).